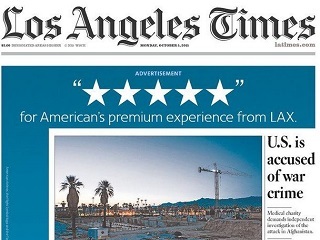 From Newseum, a reminder that front-page ads like the L.A. Times-American Airlines are centuries-old. Several decades before the Los Angeles Times was founded in 1881, there was The Neosho Herald in Neosho, Mo. That is, until 1861, when Confederates seized Archibald M. Sevier’s printing press, took it to Arkansas and destroyed it. Notice that there is no portion of the Jesse James article on the front page. For that, readers had to look inside. Our thanks to Newseum online managing editor Sharon Shahid for serving up this great reminder that long before Monday’s L.A. Times American Airlines front-page ad, U.S. newspapers were relying on such mechanisms to make money. However, the LAT’s Oct. 5 splash is indeed the first modern-era one to inset the articles so fully within the ad.